This sample price: priced within the past 7 days for arrival on Saturday, September 14, 2019, departure from San Francisco, CA. Choose your own departure city and dates. Take an unforgettable vacation through Germany and visit Berlin, Munich, Fussen, Rothenburg and Heidelberg with the ICE Train and a rent a car. There is simply no shortage of museums, churches, parks, historic sights or activities to explore in these fascinating cities. This is a flexible vacation package. Select your number of nights in the city, desired hotel and activities. The German capital holds a world cultural record with three opera houses, two concert halls and eight symphony orchestras. This is the heart of Germany, with a stoic beat that echoes through grand public buildings, glorious museums and theatres, urbane restaurants, bustling pubs and raucous nightclubs. Today, structures of steel and glass tower over streets, and parks and gardens are again lush. With its field of new skyscrapers and hip clubs and fashion boutiques, post millennium Berlin has recast itself as the Continent`s capital of cool. Brandenburg Gate, Reichstag, Berlin Cathedral, Museum Island, Berlin TV Tower, Holocaust Memorial, Berlin Wall Memorial, Check Point Charlie and so much more! Big-city style and rural charm, Alpine character and Mediterranean verve, art treasures and the Oktoberfest, traditional customs and high technology, beer gardens and haute cuisine, operas and cool bars; these are all ingredients that makes Bavaria's state capital so endlessly fascinating, and so popular with visitors from all over the world. Sprawling Munich is one of Germany's major cultural centers, second only to Berlin in terms of museums and theaters. It's also one of Germany's most festive cities, and its location, at the foot of the Alps, is idyllic. Munich's self-imposed image is that of a fun-loving and festival-addicted city - typified by its Oktoberfest. Marienplatz and the New Town Hall of Munich, Frauenkirche - Cathedral of Our Blessed Lady, Dachau Concentration Camp, The English Garden, Beer Halls, Viktualienmarkt, Residence Palace of Munich, Deutsches Museum, Museums Ensemble: Alte Pinakothek, Neue Pinakothek, Pinakothek der Moderne, Olympic Stadium of Munich, BMW Museum and much more. Füssen, often called the romantic soul of Bavaria, is famed for its location being in the kings nook (Königswinkel), and its closeness to King Ludwig`s dream castle. Situated on one of the most scenic German holiday routes, the Romantic Road (Romantische Straße), starts (or ends) here. The area is surrounded by beautiful nature, history and the most famous German Castles, as well as rolling hills, green meadows, and the peaks of the Alps. The scenery is breathtaking, especially on a sunny day. Neuschwanstein Castle, Schloss Hohenschwangau, Museum der Bayerischen Könige, Tegelberg Cable Car, Museum Füssen, Medieval Town Center, Lake Forgensee, Kloster St. Mang, Wieskirche Church, and so much more! Often considered one of the most attractive towns in Germany, it`s also one of the most popular stopovers on the country`s beautiful Romantic Road tourist route. Picturesquely positioned on the steep banks of the River Tauber, its walls and towers have remained unharmed since the Thirty Years War of 1618. Adding to the experience are the many great museums dealing with the town`s rich history, along with countless architectural splendors such as the 13th-century Town Hall (Rathaus), the 14th-century Council Tavern, and its many fine old churches. As you explore the town`s impressive old streets and buildings, you`ll feel as if you stepped back in time. St. Jacob`s Church, Market Square, The Town Hall, The Old Town Walls, Medieval Crime Museum, The Christmas Museum, The Imperial Town Museum, Double Bridge, Old Town, and so much more! This town is especially famous for its oldest German University of Heidelberg (1386). As students always made up the majority of population, it escapes from the war air raids and managed to preserve the ancient buildings from Middle Ages and Renaissance. Beside the University decorated with towers and turrets, you can admire the Heidelpberg Castle, with its charming color changing with the sunlight. 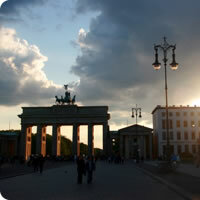 You can get excellent photos from the Karl-Theodor Bridge or walk along the famous Philosophenweg. Germany's landscape is straight from the Fairy tales: castles, deep dark forests and mythical rivers. The German landscapes are extraordinarily diverse, with graceful big-city appeal, small picture-postcard towns, pagan-inspired harvest festivals, a wealth of art and culture, and the perennial pleasures of huge tracts of forest, delightful castles and fine wine and beer. From Charlemagne and the Holy Roman Empire to the rise and fall of the Berlin Wall, no other nation has molded Europe the way Germany has - for better or worse.